Learn about "kn" words like "knight" and "knee" in this worksheet. Embrace wacky spelling with these "kn" words. 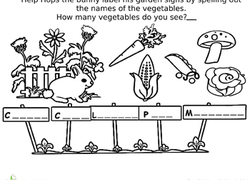 This fun worksheet is a great way to sneak spelling practise into coloring time, and you'll be encouraging nutritious eating while you're at it! This exercise focuses on words that start with Y and Z! colour the pictures that start with the Y sound brown and the Z sound yellow.